Senckenberg scientist Hervé Bocherens has studied the extinction of mega-herbivores – plant-eating animals that weighed more than one ton – that occurred approx. 12,000 years ago. The scientist from Tübingen reached the conclusion that, on the one hand, modern man was the cause of these giant terrestrial animals' extinction, and on the other hand, humans took over part of the animals' ecosystem functions. In his study, recently published in the scientific journal Frontiers in Ecology and Evolution, he concludes that the reintroduction of large animals in certain parts of the world could have a positive effect in regard to species diversity. Today, there are only few animals that weigh in at a ton or more. Elephants, hippopotamuses and rhinoceroses are among these "mega-herbivores," and despite their large size, their populations are endangered. "Under geological aspects, the small number of so few large animal species presents an anomaly," explains Professor Dr. Hervé Bocherens of the Senckenberg Center for Human Evolution and Palaeoenvironment at the University of Tübingen, and he continues, "The most prominent example of prehistoric giants is, of course, the dinosaurs." 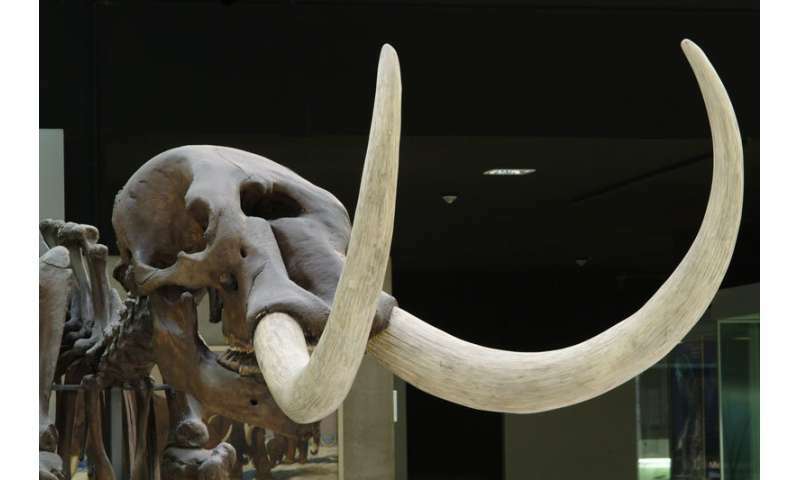 But the more recent geological history also included colossal animals such as the giant sloths, woolly rhinoceroses, and mammoths. The biogeologist from Tübingen now examined the reasons for these animals' extinction around 12,000 years ago and its consequences for the environment. "Like modern-day elephants, these mega-herbivores acted as 'ecosystem engineers.' They reduced the tree cover and kept open the landscape and the watering holes that are of vital importance for many animals. Plant seeds were transported over many kilometers in the animals' digestive tract, thus aiding in their distribution," explains Bocherens. In his recent study, he shows that these tasks were taken over in part by modern humans in the period between 45,000 and 12,000 years ago. "During this epoch, modern man spread across northern Eurasia, North and South America and Australia, and the giant herbivores gradually became extinct," adds Bocherens. With the "Neolithic revolution," the rise of agriculture and animal husbandry, the keeping of stores and a sessile lifestyle, the functions of the extinct "ecosystem engineers" were partially replaced. But in certain areas, such as the agriculturally ill-suited Subarctic – once home to the mammoth steppe – there remained a gap in this respect that continues until today. The lifestyle of these giant animals impacted the entire vegetation – trees were kept small and other plants had sufficient room and nutrients for their growth. The diversity of the flora, in turn, had a positive effect on the faunal diversity. Following the extinction of the giant herbivores, the steppes turned into boreal coniferous forests. This led to a reduction of the so-called "albedo effect": Instead of a white layer of snow in the winter or a yellow landscape with dry grasses in the summer, the forests' dark green color reflects less solar radiation, leading to a warming of the climate. Moreover, the soils of the mammoth steppe were drier and emitted less of the greenhouse gas methane. Bocherens comments, "The presence of giant herbivores thus not only contributed to a higher species diversity, it also had an effect on the global climate." According to the study, a better understanding of the differences as well as the similarities between the effects of the extinct mega-herbivores and the human landscape on the ecosystems may aid in better predicting the future of terrestrial ecosystems. "In some areas of the world, it may even make sense to reintroduce such mega-herbivores in order to increase biodiversity, thereby avoiding global warming," adds Bocherens in summary.